On our most recent date night, my husband and I (along with some friends) ate at Palace Kitchen, a Tom Douglas restaurant here in Seattle. I’ve mentioned this before but I am eating my way through all 13 of his restaurants. . and it’s been overwhelmingly delightful. 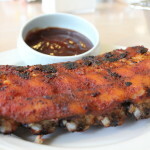 Seriously, the next time you are here in Seattle, you must make a reservation and eat at the Palace Kitchen. If you’re into great food and a cool scene, this is your restaurant. Since we went with other couples, I was able to taste a few other dishes. . between the six of us, we ate the following: red wine braised ox tongue, crispy fried pig tail, warm beet salad, painted hills flat iron steak, ravioli, all the guys ate the palace burger royale (big surprise) and for dessert, we all shared the chocolate peanut butter mousse bar and of course, had a slice of the Dahlia triple coconut cream pie. The one dish not mentioned above was a coal roasted brussels sprouts dish with crispy shallots, apples, and a malted barley glaze. This is what I ordered for my appetizer but this dish could have been my meal. It was so freaking delicious and I wanted more. Not sure why but I was never a huge fan of brussels sprouts. . . that is, until I tasted this dish at the Palace Kitchen. 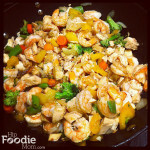 I left that night wanting to try to re-create this magical, freakishly delicious dish. And then my March issue of Food & Wine came in the mail. This issue is all about the All-Time Greatest Recipes from Legendary Cooks: Julia Child, Jacques Pepin, Marcella Hazan, Paula Wolfert and – one my favorites: Jean-Georges Vongerichten! (I also love his wife, Marja. Damn, I would love to eat dinner at their house.) As I was flipping through the magazine, I came across J-G’s Roasted Brussels Sprouts with Toasted Pecans and Avocado!! 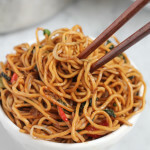 This dish is a must try . . so maybe pin this one for an upcoming Meatless Monday because, to me, this is a meal. 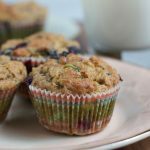 I love all of the different flavors and textures that you get in one bite: the crisp roasted brussels sprouts, creamy avocado and toasted, crunchy pecans. . it’s wonderfully delicious! 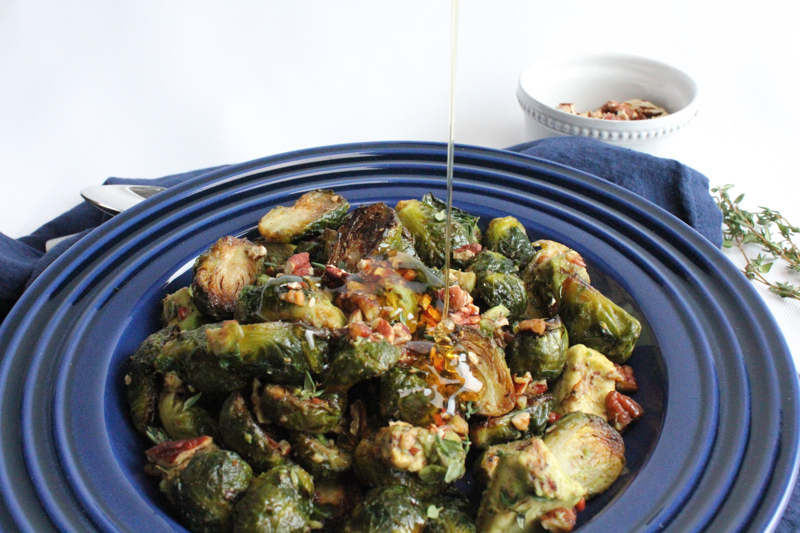 When you roast brussels sprouts, they get sweeter but I took it one step further and drizzled on some honey. oh my. And I didn’t forget about the unforgettable coal roasted brussels sprouts dish with crispy shallots, apples, and a malted barley glaze from the Palace Kitchen. You’d better believe I am working on this malted barley glaze and adding the crispy shallots and apples when I make this again. In a large saucepan of salted boiling water, blanch the brussels sprouts until bright green, for about 3 minutes. Drain well, cut in half and pat dry. On 2 large rimmed baking sheets, toss the brussels sprouts with the olive oil. Season with salt and pepper and turn them cut sides down. Roast in the upper and lower thirds of the oven for about 20 minutes, until just tender and nicely browned on the bottom; switch the baking sheets halfway through roasting. 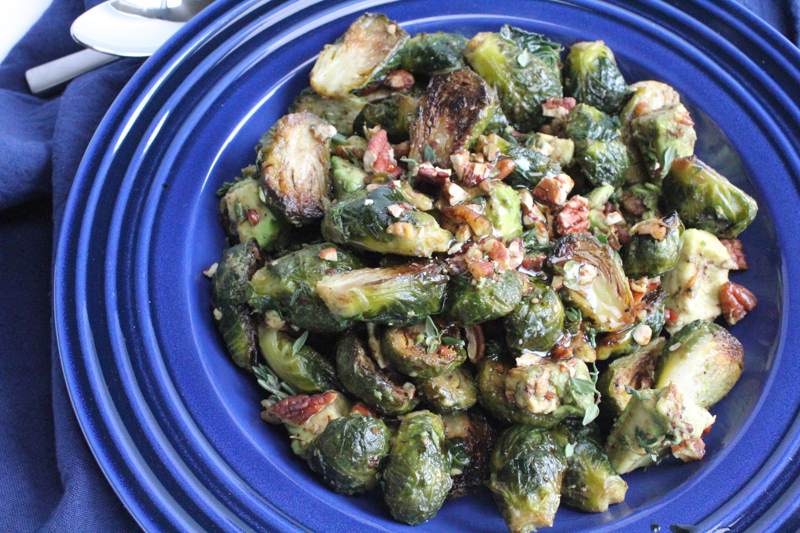 In a large bowl, toss the brussels sprouts with the pecans, avocado and thyme. Season with salt and pepper and transfer to a bowl. 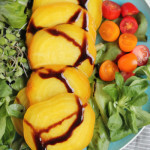 Drizzle with the balsamic vinegar, drizzle with honey and serve. 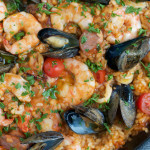 Recipe adapted from Jean-Georges Vongerichten as shown in Food & Wine magazine. 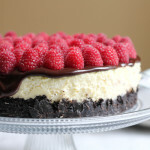 Oh my that looks absolutely delicious!! Love all the ingredients!! Beautiful colors too! Thank you, Brandi! This dish was so wonderful. . I hope you give it a try! Roasted, any vegetable turns into a wonder. Add almonds and honey, and you have a fan of this recipe right here. Love this one Alice! This is simply gorgeous Alice. 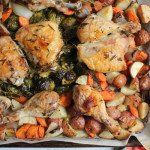 Great recipe and delicious pictures…I love roasted anything so this recipe is just amazing to me. Thanks for sharing and have a lovely day! oh this sounds intriguing! I never thought to mix brussels sprouts and avocado together! It’s so wonderfully good. . I hope you try it! and hey, it’s a Jean-Georges Vongerichten recipe. What more do you need? This looks amazing!!!! Two of my favourite things in the world are roasted brussel sprouts and avocados and I never thought to put them together. I’m definitely going to try this!!! 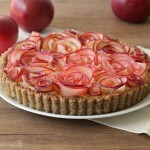 I can’t take credit for this awesomeness. . as I noted above, this excellent recipe is from Jean-Georges Vongerichten! 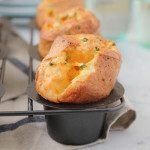 It’s so awesomely delicious. . you must try it and let me know how you like it!! 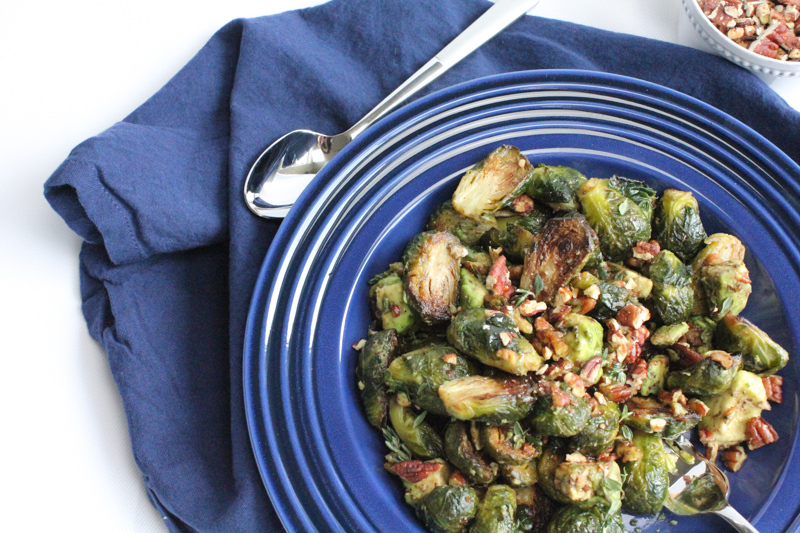 ohhh yums, roasted brussels sprouts with toasted pecans and avocado sounds good. 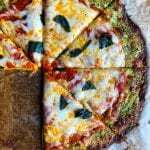 Alice, I loved this recipe. I do not experiment with brussels sprouts much, but this dish looks wonderful and now, I am craving for some brussels sprouts! thank you so much! I hope you give this one a try! 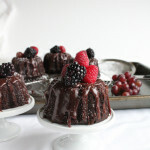 You’ve reminded me to order Tom Douglas’ dessert cookbook…I’m a huge fan! Wow, I’d never have thought of adding avocado, but it sounds like an amazing way to serve Brussels sprouts. Oh my, this looks amazing! 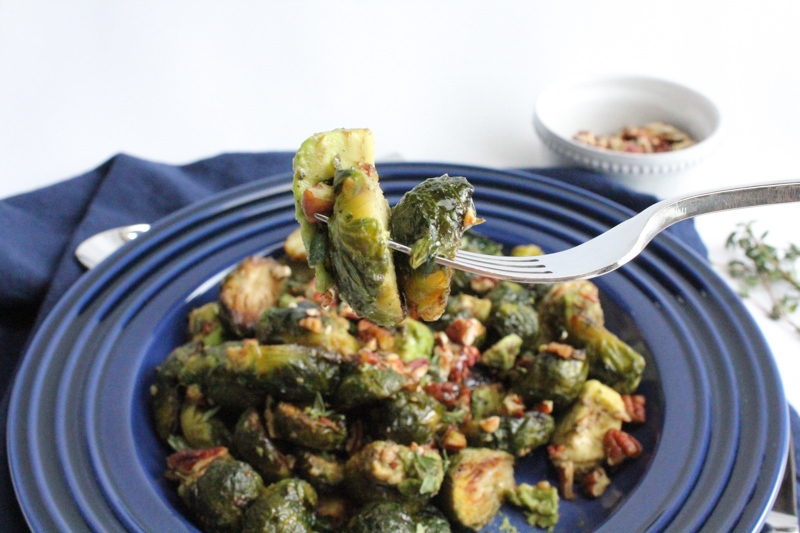 We eat a TON of brussel sprouts at our hosue, so I will definitely keep this recipe in mind. I never ate them as a child, and now I am addicted to them! I like to chop them up and cook them with browned butter, garlic, balsamic vinegar, salt/pepper and then combine with ravioli or tortellini for a quick and tasty dinner. Roasted brussel sprouts are my favorite vegetable right now. This looks amazing! What a yummy dish – I love brussel sprouts as well. Could eat them all day! 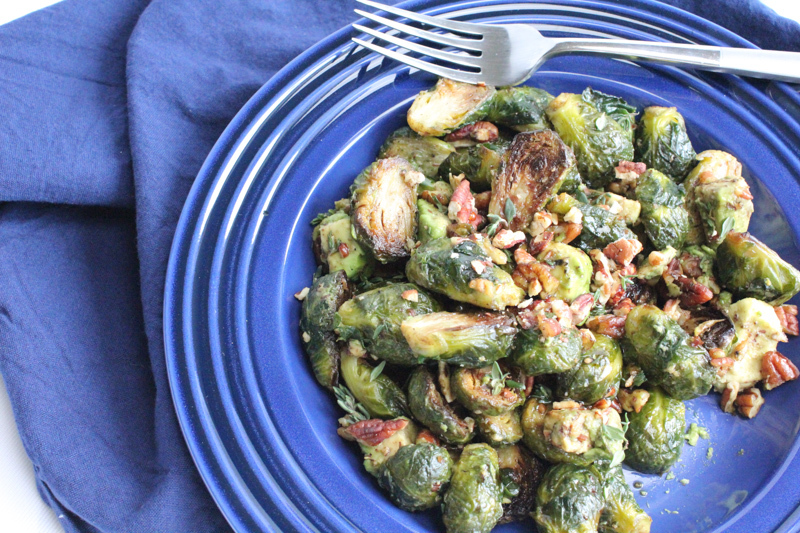 I LOVE brussels sprouts every which way and adding your delightful version to my collection! Haha, thank you Lauren! How are you? Thank you so much, Jett! So just leave the oven at 400 for the Brussel sprouts too? 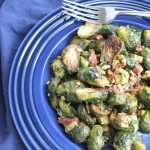 I adore brussels sprouts and for some reason I’ve never prepared them with nuts – this is genius! also love the avocado! 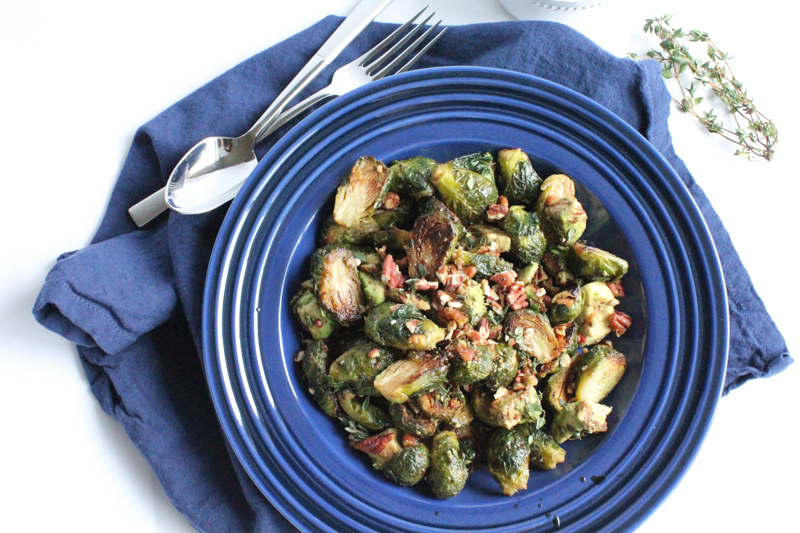 There are so many healthful qualities to this dish and next time I make brussels, I’ll be making your recipe!